Born November 16th in Chicago IL was a military sibling who moved to Germany at age 3. While overseas music was scarce to find, his introduction of hip-hop occurred when he moved back to the states in 1996 around the time 2pac was shot and killed. He wondered how could someone die over music and slowly began writing Hip-Hop. His first EP Was Named Y2K under the moniker Kray-Z Killa. This name did not fit his persona well after a bit of criticism he decided to change it. He then recorded another project under the name LsD (Lyrical Senile Dementia) an album that revolved under dark overtones of his upbringing called X-sanity. It remained unreleased. 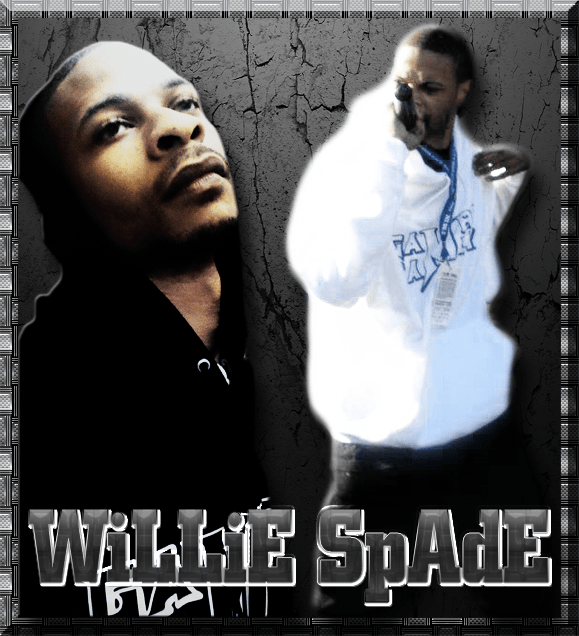 After changing his name to Willie Spade he entered internet battles on website to make a name for himself over the viral markets and released a groundbreaking classic “The Urban Renaissance” under the tutelage of Taylr Mayd (Now Slip & Slide DJ’s) honing his new battle style with metaphors and punch lines, anger driven and comedic expressions. The album however had a very east-coast sound and was relatively ignored in the market of Montgomery, Alabama but sold relatively well in Canada & England via the internet. He had to redirect his energy and change his sound if he expected to have any type of following in his new home. He then produced “The Famine” his first attempt at a southern sound, which sold moderately well, because he abandoned his previous east coast sound his internet falling turned a deaf ear to this project, but his city began to notice his skills. He worked with Per’pos, L-gin, 2 Face Ent, Slimm B, Yankee of Envy Cheifs, Youngface, Kaution, and many more local artists. He linked up with Na’Ledge from New York who had moved to Alabama for school (who is now associated with Akademy and have created their own following in their home of Long Island). Spade was ahead of many artists locally in terms of lyrical ability they set out to make “The Civil War” Album which comprised of both east coast and southern beats with intense punch lines the album received rave-reviews and catapulted both emcee’s to a larger market as well as re-establishing his fan base with his internet following. This album gave Willie the opportunity to perform in Harlem, NY for the 2007 ING NYC Marathon. After which Na’ledge moved back to NY. Willie Spade set out to solidify his spot in Montgomery and released his best solo work to date “The Gump-Gumbo Mixtape” which featured elements from The Famine, The Civil War, battle tracks from foes on the internet as well as a slew of new material that faded the line between southern music and east coast music. Willie Spade began to do more shows and linked up with Cult Classic group River City Ryders and made 8 appearances on their album “Kollision Kourse” in the absence of one of their group members. Willie Spade had finally decided that he wanted to give up music and turn his attention towards other things. Around the time of recording his final album at that time title “Self-Immolization” he linked back up with Mick Swagga then named “Mr.” with the intent to help delevop his singing style and market him around the city. Mick suggested the best idea would be to do a compilation album and move the material that way. Eventually the dynamic between Spade & Swagga was apparent. Spade’s creative musical mind and Mick Swagga understanding of music and range before they knew it they had 9 songs done of a 15 album project within weeks. The Gambit Family was born.